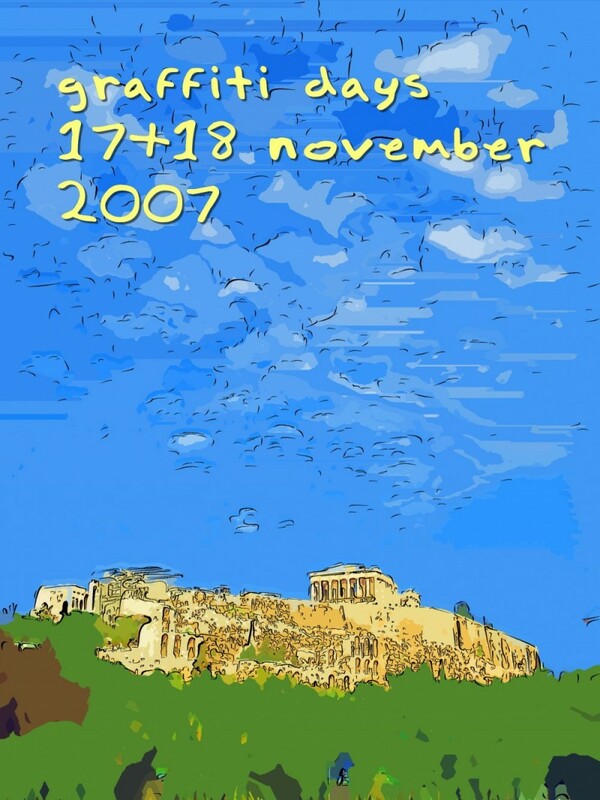 graffiti days are approaching soon... tic - toc ..
Dimitrios (ATHENS, Greece) on 6 November 2007 in Art & Design. A new theme for your talents to be put into action. Wall graffiti always fascinated me. A strong message is given, an art is produced for all to enjoy free of charge or maybe it can be ugly. So go out , look around, small or big does not matter, find the graffiti that impresses you, photograph it and show to the am3-world this great form of expression or dislike if you think it does so. on Saturday 17 and Sunday 18 NOVEMBER 2007. ADVERTISE the idea to as many of your am3 friends as possible. I have to admit that I'm usually not much of a fan of photos treated to look like paintings, etc., so when I say that I think the effect is fantastic, here, it's meant to be a real compliment! This is very tasteful, indeed, and makes a great poster, advertising this special event that you're promoting. I'll also advertise the graffiti days on my homepage up to, and including, that weekend. @Images by KC Photography: looking forward to your contribution from Seattle, see the Athens one! I'm not a fan of graffiti, but what you did here is very interesting! Somebody said in the comments above, that it might make a very good poster on the theme....and I totally agree! Still looking for good one! Such a colorful shot! Where did you take it! @Vahid: but in Athens of cource, PLAKA near Constitution square, lods of good ones if you have time to look around, see ya Vahid. OK,. I'm in. Just hope I remember!?? @FC: put your PC alarm ON! Sweet idea Dimitrios!!! I'll be looking for a good one!!! I'll have to drive in to the city, but I'll be sure to keep my eyes open! Still coming up with the great ideas! I'll do my part as well. This is an awesome shot D!!! let the count down begin! Neat work! I hope i can get a graffiti shot to post. Hello Dimitrios, what a beautiful print of the akropolis! I can tell you I already posted my graffiti!! Because I'm Dutch and you asked Dhini if her name was Dutch I only can tell you her name comes from one of the most lovely and beautiful countries in the world, a Dutch poet (Multaltuli) called it "The Emerald Belt".